Cracked sewer pipes can mean more than just an expensive repair. They can result in extensive and costly property damage. They can also lead to serious health risks. In Hartford, the rest of Connecticut and southern MA, Allied Drain Cleaning is your local source for quality sewer repair or replacement services at any time. We are sewer line repair specialists in CT and are available 24/7 to help you. Noticeable sewage backup in your toilet or tub. Cast iron pipes may suffer from corrosion, rust, and ultimately pipe breakdown. Clay pipes often become brittle, cracking in multiple areas if improperly installed. PVC/ABS plastic pipe may suffer cracks if water temperatures exceed rated limits for materials. Tree roots may grow over, under or through a sewer line pipe. Weather – the ground freezing and thawing. In general, any type of pipe—regardless of the materials it’s made of—can break due to extreme inner (water) and outer (ground) pressure. Do you think your sewer line needs repair or replacement? 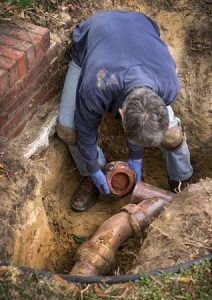 When we carry out a sewer line repair we ill do a full assessment of your sewer system, checking for sewer pipe cracks and damage.Your property and sewer system are unique but we may be able to address some basic issues. Bursting: If your sewer pipe is beyond repair, we may install a new sewer pipe through the old one. This technique uses hydraulics to break apart the damaged pipe and replace it seamlessly with a new pipe. If repair is not possible, it may be time to schedule a sewer line replacement. We will explain your options and show you exactly how we are going to fix it. You can trust us to meet your needs. We do not oversell to our customers. NEVER! Our recommendations on sewer line replacement will fall within your household budget and needs.